A currently not available preprint that has important implications about the Neolithic of Europe. Sverrisdóttir, Oddný Ósk et al. The spread of farming, the neolithisation process, swept over Europe after the advent of the farming lifestyle in the near east approximately 11,000 years ago. However the mode of transmission and its impact on the demographic patterns of Europe remains largely unknown. In this study we obtained : 66,476,944 bp of genomic DNA from the remains of a 4000 year old Neolithic farmer from the site of El Portalón, 15 km east of Burgos, Spain. We compared the genomic signature of this individual to modern-day populations as well as the few Neolithic individuals that has produced large-scale autosomal data. 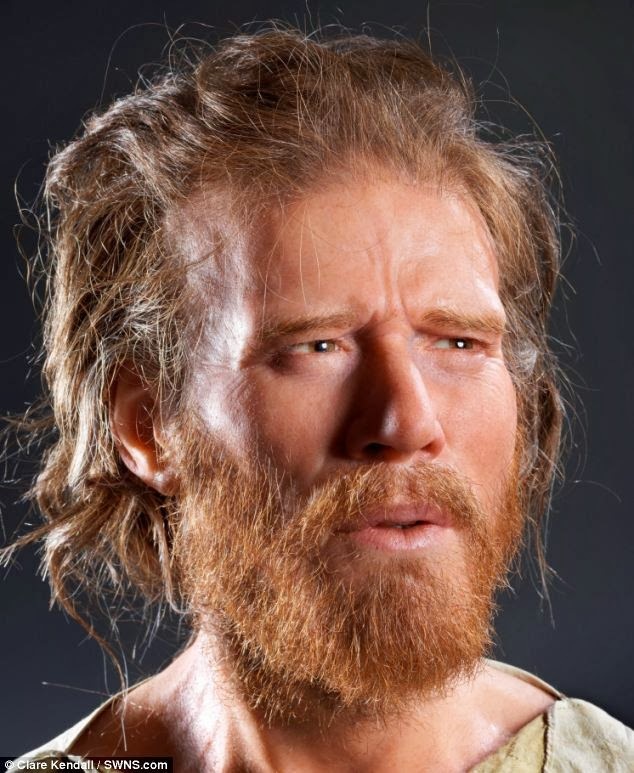 The Neolithic Portalón individual is genetically most similar to southern Europeans, similar to a Scandinavian Neolithic farmer and the Tyrolean Iceman. In contrast, the Neolithic Portalón individual displays little affinity to two Mesolithic samples from the near-by area, La Brana, demonstrating a distinct change in population history between 7,000 and 4,000 years ago for the northern Iberian Peninsula. One to three men fathered most western Europeans? It may sound far-fetched but it's certainly possible. After all, no R1b has been found in Europe before a Bell Beaker site from the 3rd millennium BC and today many Europeans (most in western Europe) belong to this haplogroup. As more Y chromosomes are sampled from ancient Europe, it will become clear if the R1b frequency actually shot from non-existence to ubiquity over a short span of time, and the Y chromosomes after the transition will be practically clones of each other. Michael J Sikora et al. Patterns of genetic variation in a population carry information about the prehistory of the population, and for the human Y chromosome an especially informative phylogenetic tree has previously been constructed from fully-sequenced chromosomes. This revealed contrasting bifurcating and starlike phylogenies for the major lineages associated with the Neolithic expansions in sub-Saharan Africa and Western Europe, respectively. We used coalescent simulations to investigate the range of demographic models most likely to produce the phylogenetic structures observed in Africa and Europe, assessing the starting and ending genetic effective population sizes, duration of the expansion, and time when expansion ended. The best-fitting models in Africa and Europe are very different. In Africa, the expansion took about 12 thousand years, ending very recently; it started from approximately 40 men and numbers expanded approximately 50-fold. In Europe, the expansion was much more rapid, taking only a few generations and occurring as soon as the major R1b lineage entered Europe; it started from just one to three men, whose numbers expanded more than a thousandfold. Although highly simplified, the demographic model we have used captures key elements of the differences between the male Neolithic expansions in Africa and Europe, and is consistent with archaeological findings. A cool new paper by a team of citizen scientists. The most important new piece of evidence is the joining together of haplogroup M (Papuans) with P in a new MP internal node. Your guess is as good as mine as to whether this MP may have come from, as his descendants are presently spread from the Atlantic via Siberia to the Amazon and all the way to New Guinea. The Mal'ta boy belonged to haplogroup R.
I am aware of a few commercial ventures to resequence Y chromosomes, and I'm pretty sure that citizen scientists will soon not only be able to re-analyze data such as those from the 1000 Genomes Project, but will be able to generate data of their own. Gregory R Magoon et al. An approach for generating high-resolution a priori maximum parsimony Y-chromosome (chrY) phylogenies based on SNP and small INDEL variant data from massively-parallel short-read (next-generation) sequencing data is described; the tree-generation methodology produces annotations localizing mutations to individual branches of the tree, along with indications of mutation placement uncertainty in cases for which "no-calls" (through lack of mapped reads or otherwise) at particular site precludes a precise placement of the mutation. The approach leverages careful variant site filtering and a novel iterative reweighting procedure to generate high-accuracy trees while considering variants in regions of chrY that had previously been excluded from analyses based on short-read sequencing data. It is argued that the proposed approach is also superior to previous region-based filtering approaches in that it adapts to the quality of the underlying data and will automatically allow the scope of sites considered to expand as the underlying data quality (e.g. through longer read lengths) improves. Key related issues, including calling of genotypes for the hemizygous chrY, reliability of variant results, read mismappings and "heterozygous" genotype calls, and the mutational stability of different variants are discussed and taken into account. The methodology is demonstrated through application to a dataset consisting of 1292 male samples from diverse populations and haplogroups, with the majority coming from low-coverage sequencing by the 1000 Genomes Project. Application of the tree-generation approach to these data produces a tree involving over 120,000 chrY variant sites (about 45,000 sites if singletons are excluded). The utility of this approach in refining the Y-chromosome phylogenetic tree is demonstrated by examining results for several haplogroups. 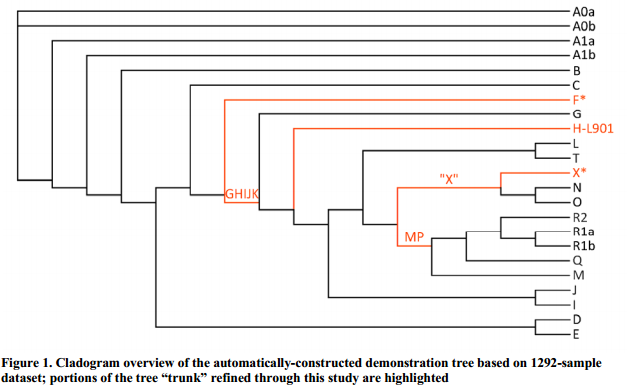 The results indicate a number of new branches on the Y-chromosome phylogenetic tree, many of them subdividing known branches, but also including some that inform the presence of additional levels along the trunk of the tree. Finally, opportunities for extensions of this phylogenetic analysis approach to other types of genetic data are examined. The study I mentioned in a previous post has now been made available in Nature. 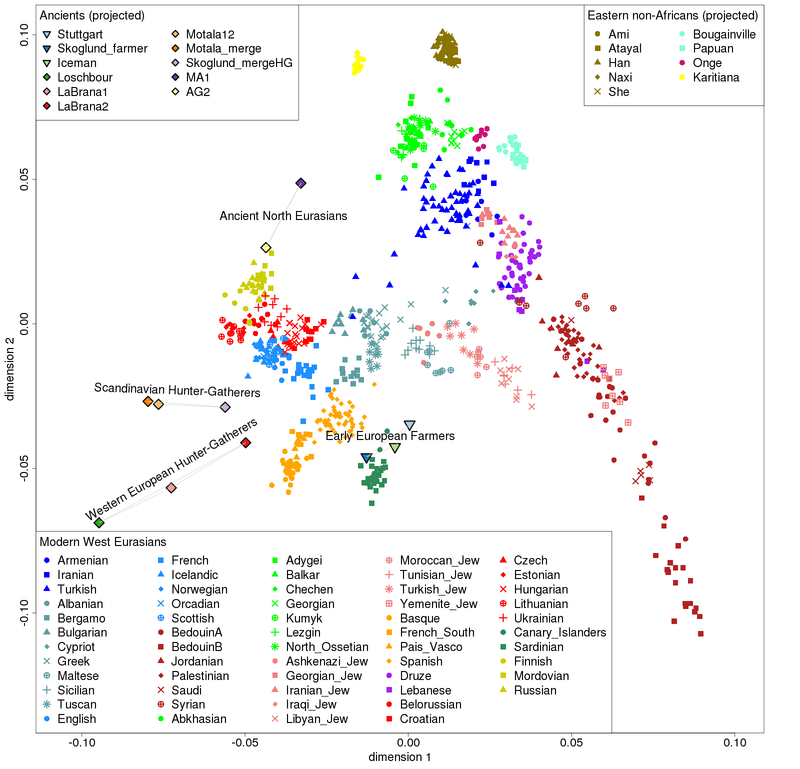 Two Upper Paleolithic Siberians (24-17kya) have been sequenced at low coverage. The better quality (and older) Mal'ta (MA-1) sample belongs to Y-haplogroup R and mtDNA haplogroup U, and the younger (but poorer quality) Afontova Gora (AG-2) sample appears to be related to it. 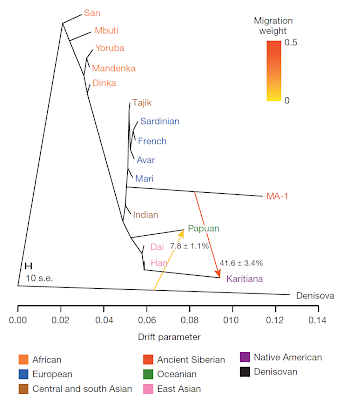 Most interestingly, there is evidence for gene flow between the MA-1 sample and Native Americans, which makes sense as these are Siberians of the period leading up to the initial colonization of the Americas. The interesting thing is that MA-1 does not appear to be East Eurasian, as proven by the test D(Papuan, Han; Sardinian, MA-1) which is non-significant, so MA-1 is not more closely related to Han than to Papuans (which is true for modern native Americans). So, it seems that the gene flow between MA-1 and Native Americans was towards Native Americans from MA-1 and not vice versa. It is fascinating that such a sample could be found so far east at so early a time. 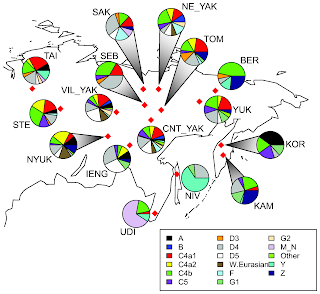 Both Y-chromosome R and mtDNA haplogroup U are very rare east of Lake Baikal which has been considered a limit of west Eurasian influence into east Eurasia. And, indeed, both these haplogroups are absent in Native Americans, so it is not yet clear how Native Americans (who belong to Y-chromosome haplogroups Q and C and mtDNA haplogroups A, B, C, D, X) are related to these Paleolithic Siberians. The obvious candidate for this relationship is Y-chromosome haplogroup P (the ancestor of Q and R). So, perhaps Q-bearing relatives of the R-bearing Mal'ta population settled the Americas. In any case, this is an extremely important sample, as its position in "no man's land" in the PCA plot (left) demonstrates, between Europeans and native Americans but close to no modern population. Its closest present-day relatives are indicated in (c), with Native Americans (red) being the closest, and a scattering of boreal populations from the Atlantic to the Pacific (but not in the vicinity of Lake Baikal) next in line (yellow). 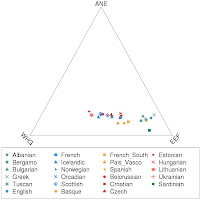 This distribution clearly related to the evidence for admixture in Europe adduced in two other recent papers, although the question of who went where and when remains to be resolved. Was MA-1 part of an intrusive western population encroaching on east Eurasians? Or did MA-1 lookalikes arrive as first settlers in empty territory, later ceding this space to east Eurasians from, perhaps, China? Did the two mix in Siberia or did they arrive in the Americas in separate migrations and mix there? And, how does this all relate to events in Europe in the far west? Also, can we now finally bury the debate when east and west Eurasians diverged? Obviously it can’t have been that recent if a >20,000 year old individual had closer affinity to western populations. We already knew that Tianyuan was more Asian than European, so I think west Eurasians diverged from the rest >40 thousand years ago. But, Tianyuan was so early that its precise relationships to different Asian groups could not be determined. So, I'd say it's a good guess that east-west split off before 40 thousand years in Eurasia. Maanasa Raghavan, Pontus Skoglund et al. Program for both days (pdf). I've seen some tweets from it using the #ancientDNA tag. The Caribbean basin is home to some of the most complex interactions in recent history among previously diverged human populations. Here, we investigate the population genetic history of this region by characterizing patterns of genome-wide variation among 330 individuals from three of the Greater Antilles (Cuba, Puerto Rico, Hispaniola), two mainland (Honduras, Colombia), and three Native South American (Yukpa, Bari, and Warao) populations. We combine these data with a unique database of genomic variation in over 3,000 individuals from diverse European, African, and Native American populations. We use local ancestry inference and tract length distributions to test different demographic scenarios for the pre- and post-colonial history of the region. We develop a novel ancestry-specific PCA (ASPCA) method to reconstruct the sub-continental origin of Native American, European, and African haplotypes from admixed genomes. We find that the most likely source of the indigenous ancestry in Caribbean islanders is a Native South American component shared among inland Amazonian tribes, Central America, and the Yucatan peninsula, suggesting extensive gene flow across the Caribbean in pre-Columbian times. We find evidence of two pulses of African migration. The first pulse—which today is reflected by shorter, older ancestry tracts—consists of a genetic component more similar to coastal West African regions involved in early stages of the trans-Atlantic slave trade. The second pulse—reflected by longer, younger tracts—is more similar to present-day West-Central African populations, supporting historical records of later transatlantic deportation. Surprisingly, we also identify a Latino-specific European component that has significantly diverged from its parental Iberian source populations, presumably as a result of small European founder population size. 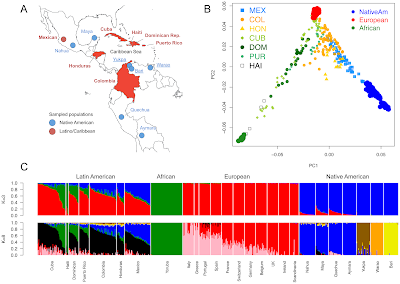 We demonstrate that the ancestral components in admixed genomes can be traced back to distinct sub-continental source populations with far greater resolution than previously thought, even when limited pre-Columbian Caribbean haplotypes have survived. It seems like yesterday that a paper suggested a Southeast Asian origin of domestic dogs. It always seems that ancient DNA upsets inferences from modern populations alone. The geographic and temporal origins of the domestic dog remain controversial, as genetic data suggest a domestication process in East Asia beginning 15,000 years ago, whereas the oldest doglike fossils are found in Europe and Siberia and date to >30,000 years ago. We analyzed the mitochondrial genomes of 18 prehistoric canids from Eurasia and the New World, along with a comprehensive panel of modern dogs and wolves. The mitochondrial genomes of all modern dogs are phylogenetically most closely related to either ancient or modern canids of Europe. Molecular dating suggests an onset of domestication there 18,800 to 32,100 years ago. These findings imply that domestic dogs are the culmination of a process that initiated with European hunter-gatherers and the canids with whom they interacted. The age estimate for this allele is quite old but with a huge 95% confidence interval. Hopefully ancient DNA can illuminate the trajectory of the allele's frequency through time and space. Chandana Basu Mallick et al. Skin pigmentation is one of the most variable phenotypic traits in humans. A non-synonymous substitution (rs1426654) in the third exon of SLC24A5 accounts for lighter skin in Europeans but not in East Asians. 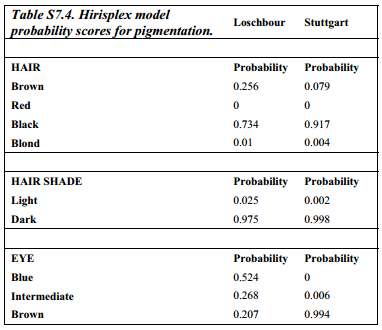 A previous genome-wide association study carried out in a heterogeneous sample of UK immigrants of South Asian descent suggested that this gene also contributes significantly to skin pigmentation variation among South Asians. 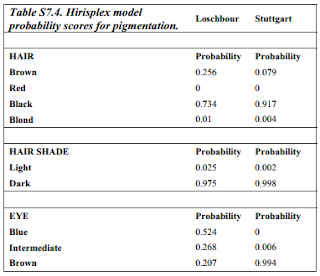 In the present study, we have quantitatively assessed skin pigmentation for a largely homogeneous cohort of 1228 individuals from the Southern region of the Indian subcontinent. Our data confirm significant association of rs1426654 SNP with skin pigmentation, explaining about 27% of total phenotypic variation in the cohort studied. 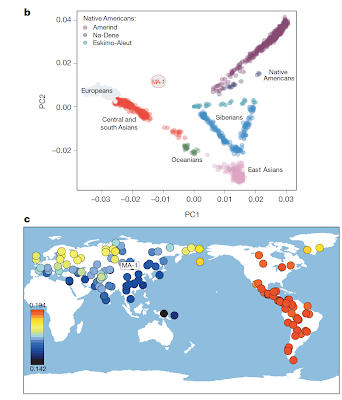 Our extensive survey of the polymorphism in 1573 individuals from 54 ethnic populations across the Indian subcontinent reveals wide presence of the derived-A allele, although the frequencies vary substantially among populations. We also show that the geospatial pattern of this allele is complex, but most importantly, reflects strong influence of language, geography and demographic history of the populations. Sequencing 11.74 kb of SLC24A5 in 95 individuals worldwide reveals that the rs1426654-A alleles in South Asian and West Eurasian populations are monophyletic and occur on the background of a common haplotype that is characterized by low genetic diversity. 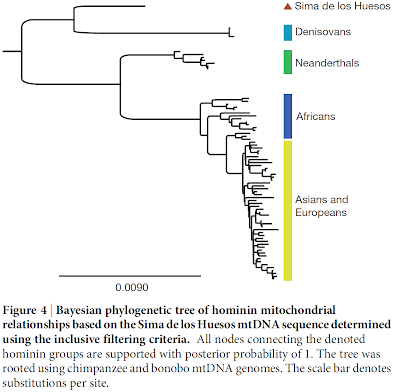 We date the coalescence of the light skin associated allele at 22–28 KYA. Both our sequence and genome-wide genotype data confirm that this gene has been a target for positive selection among Europeans. However, the latter also shows additional evidence of selection in populations of the Middle East, Central Asia, Pakistan and North India but not in South India. The haplogroup retrieved has so far not been found in modern cattle. However, as mtDNA represents a single genetic locus, it is prone to genetic drift and could easily have been lost by drift even if hybridization between the population to which the Chinese specimen belonged and other domesticated cattle populations has occurred. Further analyses on nuclear DNA will be necessary to show whether this early Chinese cattle management was a short-lived episode or whether it has contributed to the nuclear gene pool of modern cattle. 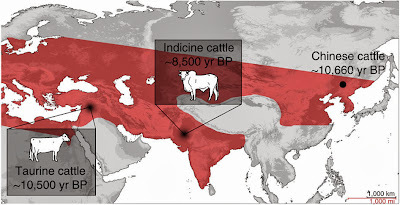 The domestication of cattle is generally accepted to have taken place in two independent centres: around 10,500 years ago in the Near East, giving rise to modern taurine cattle, and two millennia later in southern Asia, giving rise to zebu cattle. Here we provide firmly dated morphological and genetic evidence for early Holocene management of taurine cattle in northeastern China. We describe conjoining mandibles from this region that show evidence of oral stereotypy, dated to the early Holocene by two independent 14C dates. Using Illumina high-throughput sequencing coupled with DNA hybridization capture, we characterize 15,406 bp of the mitogenome with on average 16.7-fold coverage. 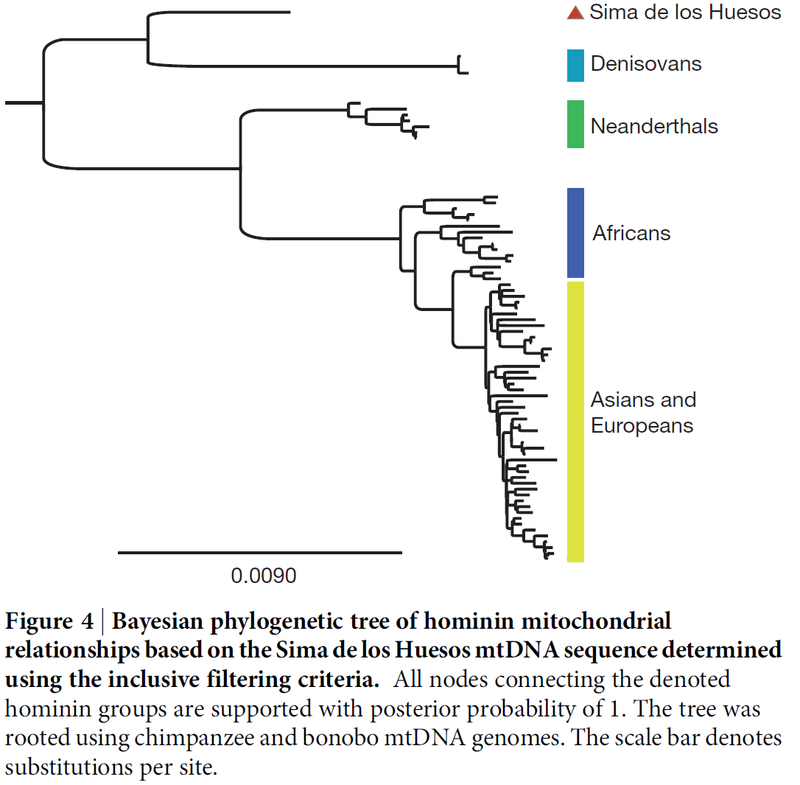 Phylogenetic analyses reveal a hitherto unknown mitochondrial haplogroup that falls outside the known taurine diversity. Our data suggest that the first attempts to manage cattle in northern China predate the introduction of domestic cattle that gave rise to the current stock by several thousand years. We announce the release of an advanced version of the Molecular Evolutionary Genetics Analysis (MEGA) software, which currently contains facilities for building sequence alignments, inferring phylogenetic histories, and conducting molecular evolutionary analysis. 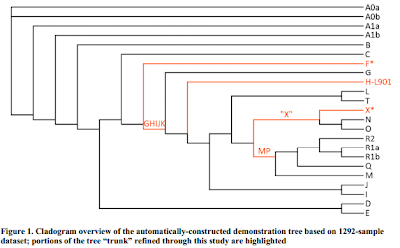 In version 6.0, MEGA now enables the inference of timetrees, as it implements the RelTime method for estimating divergence times for all branching points in a phylogeny. A new Timetree Wizard in MEGA6 facilitates this timetree inference by providing a graphical user interface (GUI) to specify the phylogeny and calibration constraints step-by-step. This version also contains enhanced algorithms to search for the optimal trees under evolutionary criteria and implements a more advanced memory management that can double the size of sequence data sets to which MEGA can be applied. Both GUI and command-line versions of MEGA6 can be downloaded from www.megasoftware.net free of charge. False positive IBD segments are a real problem for those who wish to use genotype data to establish family connections with distant relatives. Traditionally, this involves finding shared common IBD segments, and then comparing genealogies to find potential common ancestors from which these segments could be inherited. IBD is also used in population genetics (e.g., Coop & Ralph 2013). There is an obvious tradeoff, since sloppy IBD detection may enable more genealogical links to be established but adds to the burden of establishing the validity of these links (the infamous "ignoring contact requests from potential genetic cousins" issue). It will be nice if this technology finds its way to end users who stand to most benefit from it. Analysis of genomic segments shared identical-by-descent (IBD) between individuals is fundamental to many genetic applications, but IBD detection accuracy in non-simulated data is largely unknown. Using 25,432 genotyped European individuals, and exploiting known familial relationships in 2,952 father-mother-child trios contained therein, we identify a false positive rate over 67% for short (2-4 centiMorgan) segments. We introduce a novel, computationally-efficient, haplotype-based metric that enables accurate IBD detection on population-scale datasets. There is considerable ethno-linguistic and genetic variation among human populations in Asia, although tracing the origins of this diversity is complicated by migration events. Thailand is at the center of Mainland Southeast Asia (MSEA), a region within Asia that has not been extensively studied. Genetic substructure may exist in the Thai population, since waves of migration from southern China throughout its recent history may have contributed to substantial gene flow. 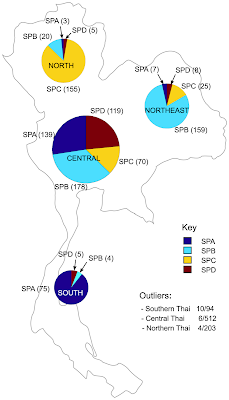 Autosomal SNP data were collated for 438,503 markers from 992 Thai individuals. Using the available self-reported regional origin, four Thai subpopulations genetically distinct from each other and from other Asian populations were resolved by Neighbor-Joining analysis using a 41,569 marker subset. Using an independent Principal Components-based unsupervised clustering approach, four major MSEA subpopulations were resolved in which regional bias was apparent. A major ancestry component was common to these MSEA subpopulations and distinguishes them from other Asian subpopulations. On the other hand, these MSEA subpopulations were admixed with other ancestries, in particular one shared with Chinese. 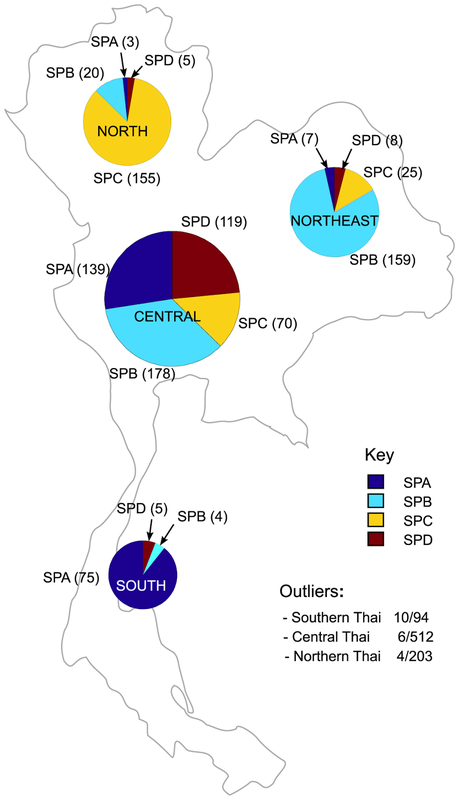 Subpopulation clustering using only Thai individuals and the complete marker set resolved four subpopulations, which are distributed differently across Thailand. A Sino-Thai subpopulation was concentrated in the Central region of Thailand, although this constituted a minority in an otherwise diverse region. Among the most highly differentiated markers which distinguish the Thai subpopulations, several map to regions known to affect phenotypic traits such as skin pigmentation and susceptibility to common diseases. The subpopulation patterns elucidated have important implications for evolutionary and medical genetics. The subpopulation structure within Thailand may reflect the contributions of different migrants throughout the history of MSEA. The information will also be important for genetic association studies to account for population-structure confounding effects. Ancient DNA and Population Turnover in Southern Levantine Pigs- Signature of the Sea Peoples Migration? Near Eastern wild boars possess a characteristic DNA signature. Unexpectedly, wild boars from Israel have the DNA sequences of European wild boars and domestic pigs. To understand how this anomaly evolved, we sequenced DNA from ancient and modern pigs from Israel. Pigs from Late Bronze Age (until ca. 1150 BCE) in Israel shared haplotypes of modern and ancient Near Eastern pigs. 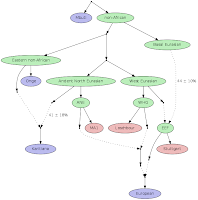 European haplotypes became dominant only during the Iron Age (ca. 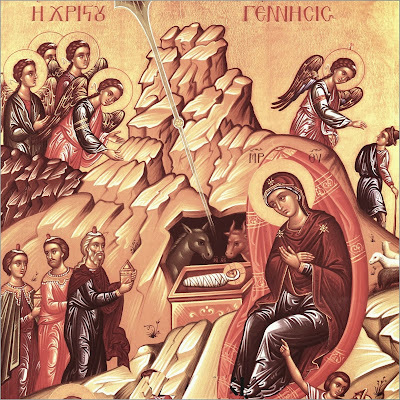 900 BCE). This raises the possibility that European pigs were brought to the region by the Sea Peoples who migrated to the Levant at that time. Then, a complete genetic turnover took place, most likely because of repeated admixture between local and introduced European domestic pigs that went feral. Severe population bottlenecks likely accelerated this process. Introductions by humans have strongly affected the phylogeography of wild animals, and interpretations of phylogeography based on modern DNA alone should be taken with caution. The database contains distributions representing 90 populations (N = 16,751 males) by the frequencies of the published and unpublished Y-chromosome Hgs. These Hgs were combined into 18 different Hgs (C, E, ABDF*, G, H, I1, I2, J1, J2, K*, L, N, O, Q, R1a, R1b, R2, T), so that published sources could be used for comparisons. As shown in Fig. 1, Middle Eastern (Class 7) and Central European Classes (Class 8) form one non-separable cluster in the central part of the figure. All of the others of the 10 classes can be identified in different well separable areas around this central region. The Central Asian (Class 4) and Northwest Caucasian (Class 9) Classes are in neighbouring areas in the upper and upper-left parts, while the Arab-Dagestanian Class (Class 1) occupies the opposite, lower-left part of the map. The North-Central and Western European (Class 3 + Class 6) as well as the Atlantic (Class 10) Classes form a common branch in the lower-left part of the figure. The opposite, upper-right branch contains the East Baltic (Class 5) and North Eurasian (Class 2) Classes. The understanding of historical relationship between populations is a core aspect of human population history studies. 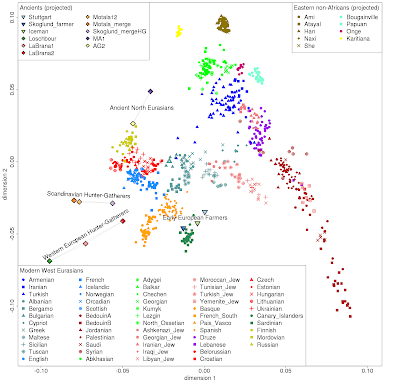 We have compared the frequency of 18 different Y-SNP haplogroups in 90 Western Eurasian populations. Classification of haplogroup distribution vectors using a new self-learning classification algorithm so called “self-organizing cloud (SOC)” proved to be an effective tool to identify population groups, which share common paternal genetic features. By means of the algorithm, we have determined 10 different classes of populations based on the similarity of haplogroup composition. 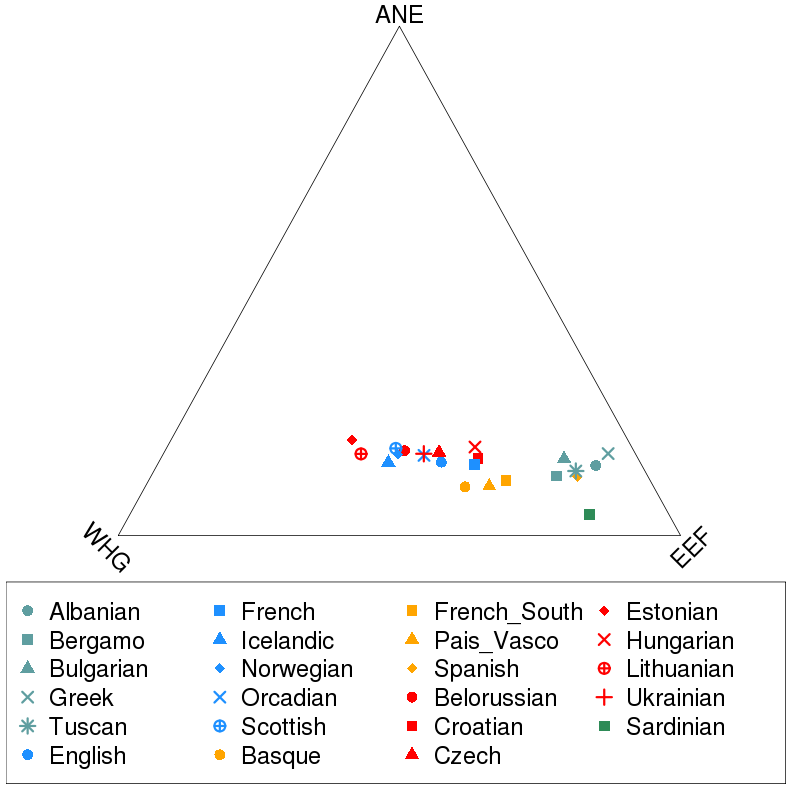 The analysis showed that paternal genetic markers tend to reflect geographical proximity of populations better than linguistic relationship, although certain Y-SNP haplogroups have relatively good correlation with specific language families. These observations are based on the comparative analysis of the Hg distributions of contemporary populations may reflect demographic history of them in the past. 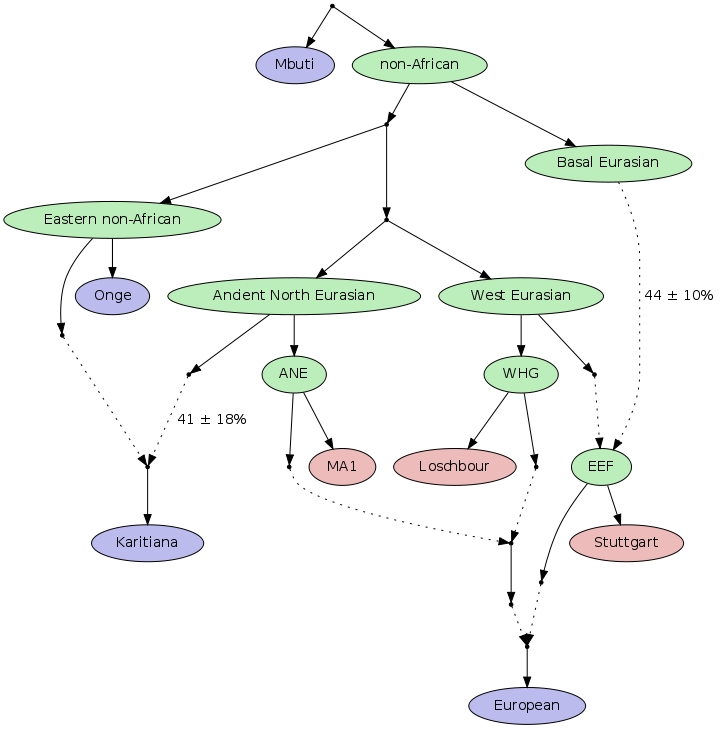 I haven't read this, but the idea seems to be that variation between Africans in Neandertal admixture can be wholly explained by recent admixture with Eurasians (who already had this type of admixture). 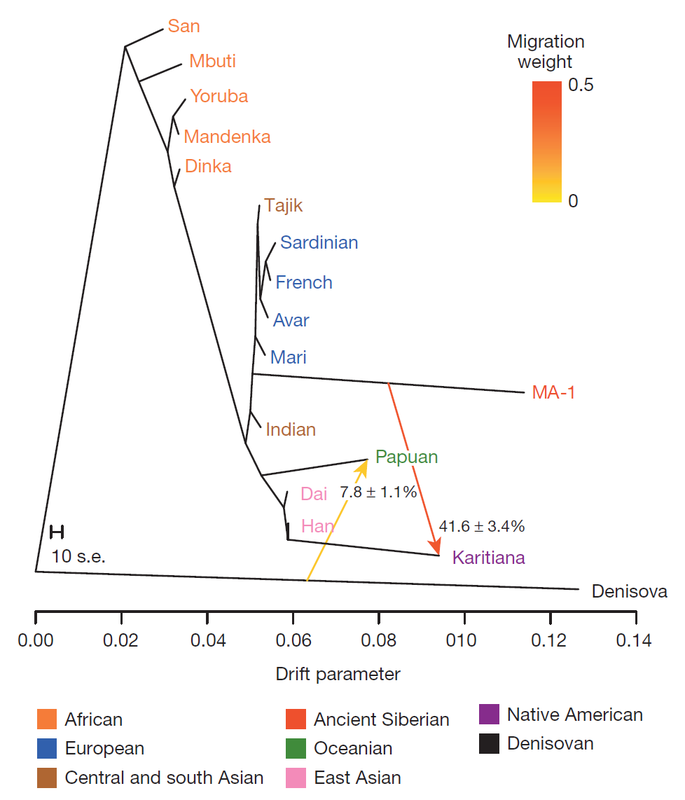 This is not very surprising, given that Neandertals were a Eurasian-distributed species, so that admixture with them cannot have taken place in Africa. The finding that Africans don't vary in their Neandertal admixture suggests that the source cannot have been an unknown African hominin related of Neandertals (in which case we'd expect to see variation in Africans). I don't know of any anthropologically plausible African cousin of the Neandertals, but, of course, the lack of anthropological evidence does not mean non-existence (cf. 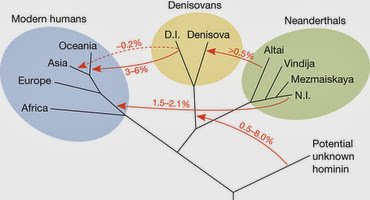 Denisovans as an anthropologically invisible Neandertal relative in Eurasia). Apparent Variation in Neanderthal Admixture among African Populations is Consistent with Gene Flow from non-African Populations. Wang S, Lachance J, Tishkoff S, Hey J, Xing J. Recent studies have found evidence of introgression from Neanderthals into modern humans outside of sub-Saharan Africa. Given the geographic range of Neanderthals, the findings have been interpreted as evidence of gene exchange between Neanderthals and the modern humans descended from the Out-of-Africa (OOA) migration. Here we examine an alternative interpretation in which the introgression occurred earlier within Africa, between ancestors or relatives of Neanderthals and a subset of African modern humans who were the ancestors of those involved in the OOA migration. Under the alternative model, if the population structure among present-day Africans predates the OOA migration, we might find some African populations show a signal of Neanderthal introgression while others do not. To test this alternative model we compiled a whole-genome data set including 38 sub-Saharan Africans from eight populations and 25 non-African individuals from five populations. We assessed differences in the amount of Neanderthal-like SNP alleles among these populations and observed up to 1.5% difference in the number of Neanderthal-like alleles among African populations. Further analyses suggest that these differences are likely due to recent non-African admixture in these populations. After accounting for recent non-African admixture, our results do not support the alternative model of older (e.g., >100 kya) admixture between modern human and Neanderthal-like hominid within Africa. I had recently mentioned Zheng He on account of his Y chromosome. 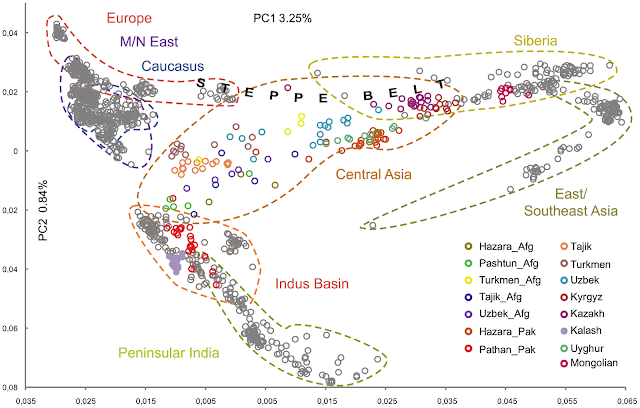 The authors note that none of the ancestral components peaks in Central Asia, concluding that this region has been a destination rather than a source of population movements. I certainly agree that Central Asia has a lot of recent history affecting it from virtually all directions. On the other hand, we should be cautious about interpreting geographical clines in terms of directionality of population movement; a good example is Sardinia which often emerges as a "focus" of Mediterranean ancestry, but this does not mean that it is the origin of such ancestry. It would certainly be interesting to remove the layers of more recent ancestry from Central Asia to see what was there before the last few thousand years. 94% of the chromosomes are distributed within the following 9 main haplogroups: R-M207 (34%), J-M304 (16%), C-M130 (15%), L-M20 (6%), G-M201 (6%), Q-M242 (6%), N-M231 (4%), O-M175 (4%) and E-M96 (3%). Within the core haplogroups observed in the Afghan populations, there are sub-haplogroups that provide more refined insights into the underlying structure of the Y-chromosome gene pool. 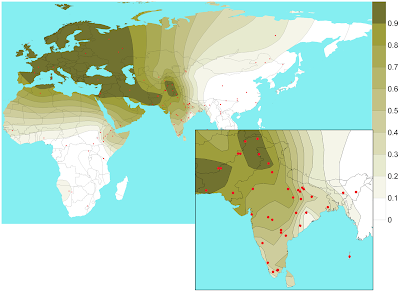 One of the important sub-haplogroups includes the C3b2b1-M401 lineage that is amplified in Hazara, Kyrgyz and Mongol populations. Haplogroup G2c-M377 reaches 14.7% in Pashtun, consistent with previous results , whereas it is virtually absent from all other populations. J2a1-Page55 is found in 23% of Iranians, 13% of the Hazara from the Hindu Kush, 11% of the Tajik and Uzbek from the Hindu Kush, 10% of Pakistanis, 4% of the Turkmen from the Hindu Kush, 3% of the Pashtun and 2% of the Kyrgyz and Mongol populations. Concerning haplogroup L, L1c-M357 is significantly higher in Burusho and Kalash (15% and 25%) than in other populations. L1a-M76 is most frequent in Balochi (20%), and is found at lower levels in Kyrgyz, Pashtun, Tajik, Uzbek and Turkmen populations. Q1a2-M25 lineage is characteristic of Turkmen (31%), significantly higher than all other populations. Haplogroup R1a1a-M198/M17 is characterized by its absence or very low frequency in Iranian, Mongol and Hazara populations and its high frequency in Pashtun and Kyrgyz populations. Julie Di Cristofaro et al. Despite being located at the crossroads of Asia, genetics of the Afghanistan populations have been largely overlooked. It is currently inhabited by five major ethnic populations: Pashtun, Tajik, Hazara, Uzbek and Turkmen. Here we present autosomal from a subset of our samples, mitochondrial and Y- chromosome data from over 500 Afghan samples among these 5 ethnic groups. This Afghan data was supplemented with the same Y-chromosome analyses of samples from Iran, Kyrgyzstan, Mongolia and updated Pakistani samples (HGDP-CEPH). 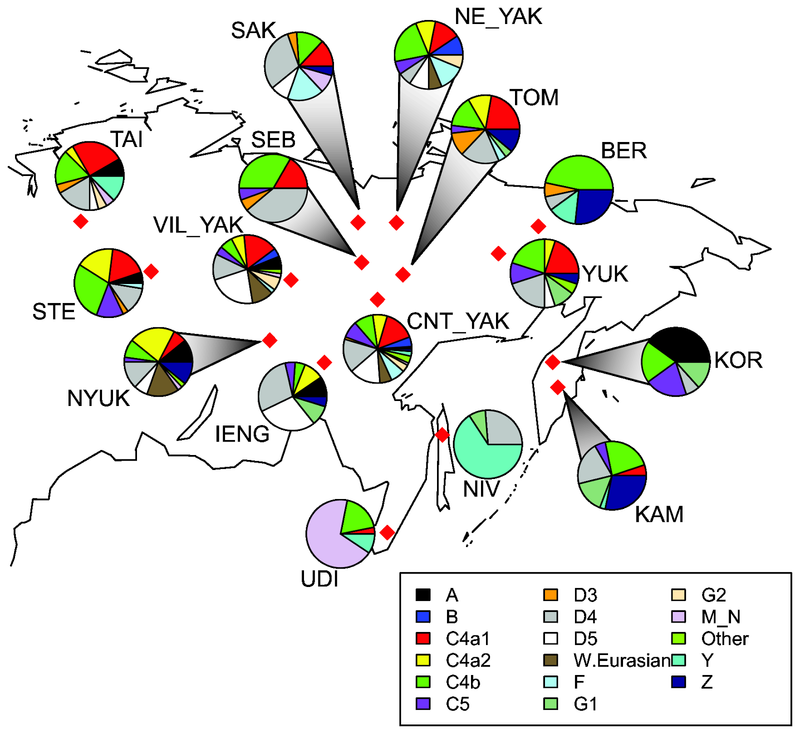 The data presented here was integrated into existing knowledge of pan-Eurasian genetic diversity. 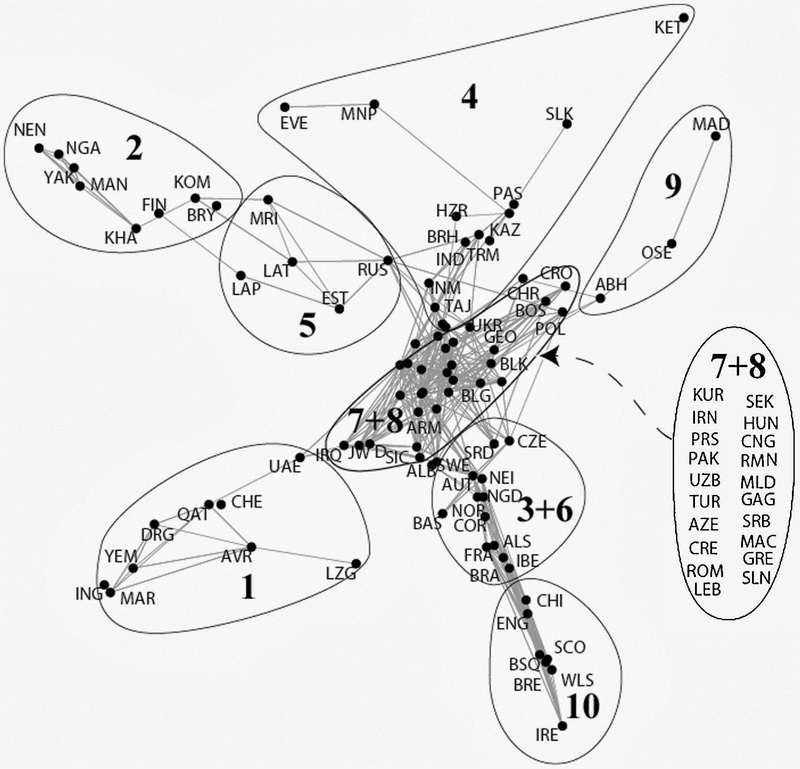 The pattern of genetic variation, revealed by structure-like and Principal Component analyses and Analysis of Molecular Variance indicates that the people of Afghanistan are made up of a mosaic of components representing various geographic regions of Eurasian ancestry. The absence of a major Central Asian-specific component indicates that the Hindu Kush, like the gene pool of Central Asian populations in general, is a confluence of gene flows rather than a source of distinctly autochthonous populations that have arisen in situ: a conclusion that is reinforced by the phylogeography of both haploid loci. We were able to tentatively call mtDNA haplogroups for these samples (Table S1). The two Bulgarian Iron Age individuals (P192-1 and T2G5) fell into haplogroups U3b and HV(16311), respectively. Haplogroup U3 is especially common in the countries surrounding the Black Sea, including Bulgaria, and in the Near East, and HV is also found at low frequencies in Europe and peaks in the Near East.41 The three Peruvian mummies fell into haplogroups B2, M (an ancestor of D), and D1, all derived from founder Native American lineages and previously observed in both pre-Columbian and modern populations from Peru. P192-1 was an Iron Age Thracian; T2G5 was from an Iron Age Thracian tumulus burial. For the Peruvian mummies, we also included 10 Native American individuals from Central and South America in the PCA (Figures 3E and 3F). Interestingly, all of the mummies fell between the Native American populations (KAR, MAY, AYM) and East Asian populations (JPT, CHS, CHB), as would be expected for a nonadmixed Native American individual (Figures 3E, 3F, and S2). These mummies belonged to the pre-Columbian Chachapoya culture, who, by some accounts, were unusually fair-skinned,39 suggesting a potential for pre- Columbian European admixture. However, based on our preliminary results, these individuals appear to have been ancestrally Native American. The Peruvian mummies were from 1000-1500AD, so it's not very surprising that they don't appear to have European admixture and to be "ancestrally Native American". Hopefully a more complete analysis of this data and production of more data with this method will follow in the future. Meredith L. Carpenter et al. Most ancient specimens contain very low levels of endogenous DNA, precluding the shotgun sequencing of many interesting samples because of cost. Ancient DNA (aDNA) libraries often contain less than 1% endogenous DNA, with the majority of sequencing capacity taken up by environmental DNA. Here we present a capture-based method for enriching the endogenous component of aDNA sequencing libraries. By using biotinylated RNA baits transcribed from genomic DNA libraries, we are able to capture DNA fragments from across the human genome. We demonstrate this method on libraries created from four Iron Age and Bronze Age human teeth from Bulgaria, as well as bone samples from seven Peruvian mummies and a Bronze Age hair sample from Denmark. Prior to capture, shotgun sequencing of these libraries yielded an average of 1.2% of reads mapping to the human genome (including duplicates). After capture, this fraction increased substantially, with up to 59% of reads mapped to human and enrichment ranging from 6- to 159-fold. Furthermore, we maintained coverage of the majority of regions sequenced in the precapture library. Intersection with the 1000 Genomes Project reference panel yielded an average of 50,723 SNPs (range 3,062–147,243) for the postcapture libraries sequenced with 1 million reads, compared with 13,280 SNPs (range 217–73,266) for the precapture libraries, increasing resolution in population genetic analyses. Our whole-genome capture approach makes it less costly to sequence aDNA from specimens containing very low levels of endogenous DNA, enabling the analysis of larger numbers of samples. Quite remarkable that a Persian (Sayyid Ajjal) would leave many descendants in faraway China, and one of this descendants (Zheng He) would one day set out to explore the West (from the perspective of China). A nice reminder of how far a Y-chromosome lineage might travel, even in the span of a couple of centuries. Sayyid Ajjal is the ancestor of many Muslims in areas all across China. And one of his descendants is the famous Navigator of Ming Dynasty, Zheng He, who led the largest armada in the world of 15th century. The origin of Sayyid Ajjal's family remains unclear although many studies have been done on this topic of Muslim history. In this paper, we studied the Y chromosomes of his present descendants, and found they all have haplogroup L1a-M76, proving a southern Persian origin. I had blogged about this conference a year ago, and a few people seem to be tweeting from it. I'll be occasionally looking at the #paleoamericanodyssey tag, but feel free to point to any other interesting tweets from the conference in the comments. The Mal'ta tradition is known from a vast area spanning west of Lake Baikal and the Yenisey River. The site of Mal'ta, for which the culture is named, is composed of a series of subterranean houses made of large animal bones and reindeer antler which had likely been covered with animal skins and sod to protect inhabitants from the severe, prevailing northerly winds. Among the artistic accomplishments evident at Mal'ta are remains of expertly carved bone, ivory, and antler objects. Figurines of birds and human females are the most commonly found items. Yet the child's Y chromosome belongs to a genetic group called Y haplogroup R, and its mitochondrial DNA to a haplogroup U. Today, those haplogroups are found almost exclusively in people living in Europe and regions of Asia west of the Altai Mountains, which are near the borders of Russia, China, and Mongolia. This suggests that the Mal'ta boy was not ancestral to Native Americans (since Native Americans don't possess Y-haplogroup R and mt-haplogroup U), although obviously is in some way related to them based on the autosomal evidence. It's hard to read between the lines, but I guess a paper in Nature will come out soon enough as it is currently "in press".